As the winter season marches on, so too does the debate surrounding whether or not putting your home up for sale during the cold, snowy months is the best approach. While many may shy away from listing their home during the winter months thanks to bad weather and freezing temperatures, if you’re home has already hit the market, there are a few simple steps you should take to keep the space in tip-top shop. While there’s nothing you can do about stopping the snow from coming, the first step toward making it easy for house hunters to view your property during or after a snow storm is to clear a path for any prospective homebuyers to walk safely and securely from your driveway to your front door. Be sure to clear off the stoop and maybe even create a short path around the house so people can look at more than just the inside. It’s also important to shake off large amounts of snow from bushes and shrubs so that they aren’t destroyed. While branches can fall easily as a result of snow, if any limbs or branches have fallen on your property, dispose of them before people come to view the house. In addition, consider building a friendly snowman on the lawn that will give prospective buyers visions of having fun in the snow with their families. And you can even leave a sled on the side, just to give them other fun things to think about. Inside the front door should be a large mat so people can wipe their feet. You may also want to encourage your real estate agent to “suggest” that people take off their shoes before walking around the house. Sometimes, though, the snow will be dragged around on rugs and floors, so be sure to clean these areas immediately after any showing. Try to remove snow and icicles from windows so that potential buyers can get a clear look outside and see the natural light come into the home. Snow can sometimes leave watery streaks on windows or glass doors that may hurt the look of a room, so grab some window cleaner and let them shine. For an open house, offer some hot chocolate to warm people up as they look around and add a plate of freshly baked cookies. You can also keep the fireplace burning as long as your agent is there to keep it lit and there’s a plan to put it out at the end of the showing. If your home has an eye-catching yard, garden, swimming pool or beautiful deck that can’t be seen or appreciated because of the snow, be sure to have pictures on hand that showcase them in the spring or summer. You don’t want to lose out on what could be major selling points. 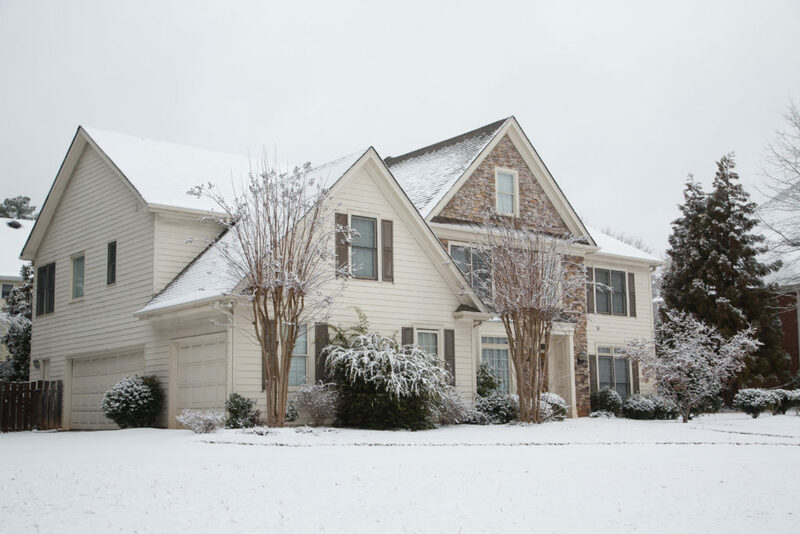 Don’t let snow hurt your chances of selling your home. By getting ahead of the problem, snow can work in your favor when it comes to making a deal.